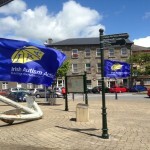 With a strong link to autism awareness in Ireland, the Keith Duffy Foundation is working to raise funds for a number of children’s charities throughout the country. Using his experience and contacts, garnered through his 14 years as patron of Irish Autism Action, Keith will organise a variety of fundraising events, with the aim of providing support and financial assistance to the foundation’s chosen charities. Support will be provided for people on the ground and will directly help individuals, families and schools, in particular. With four high-profile events per year, and eight to twelve smaller events, chosen charities will see that there are no limitations to the people who can benefit from the Keith Duffy Foundation.